Human nervous system is composed of sensory receptor of the sense (nerves which are located in the five senses), stimulus transmitter that transmits stimulus to the nerve center (sensory nerver), the central nervous which sorts and interprets the stimulus information, and motor nerve that transmits message from central nerve to effectors. Sensory nerve, nerve that transmits impulse from the sensory nerve ends to the central nerve. Central nerve, brain and spinal cords. Motor nerve, nerve that transmits impulse from central nerve to the end of nerve that is placed on effectors (e.g. muscle). Interneutron, it is composed by connector and adjuster. Connector nerve is nerve that connect one nerves to the others, whereas adjuster nerve is nerve that connect sensory neuron to motor neuron and placed on central nerve. Nervous system is composed of nervous cells (neurons). Each nervous cell is composed of dendrite, cell body and axon (neurite). Dendrite is formed by elongation of the nerve cell body forming some short branches. Dendrite is used to receive impulse which then is transmitted to the cell body. Nerve cell body is a part of nerve cell that has cytoplasm and nucleus. Axon (neurite) is elongation of nerve cell body; it is longer than dendrite, usually just one for each cell. Axon has some layers of coat called myelin sheath. Myelin sheath is composed of Schwann cells. Axon is not fully covered by myelin sheath, so there are some uncovered space. Spaces between Schwann cells are called node of Ranvier. There are two kinds of coordination by nervous system in human body. The first one is conscious coordination, which is done by conscious nervous system. The second one is unconscious coordination, which is done by unconscious nervous system. Conscious nerveous system is composed of central nervous system and peripheral nervous system. Central nervous system is composed of brain and spina cord. 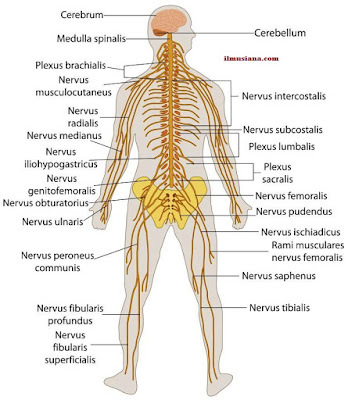 Peripheral nervous system is composed of fibrous nerve which is formed by elongation of central nerve. Brain is located in the skull cavity that is protected by brain layers (meninges) and brain fluid (cerebrospinal fluid). Brain is the central coordination of conscious nervous system. Brain consists of the largest (the most prominent) of brain (cerebrum), and midbrain (mesencephalon). Spinal cord (medulla spinals) is located in the vertebrae. The functions of spinal cord the transmitting impulse to and from the brain and controlling many reflex activities. Brain and spinal cord are conducted by continous spinal cord (medulla oblongata) that control respiration, heartbeat and widening and constriction of blood vessel. Peripheral nervous system consists of fibrous nerves which are formed by elongation of brain (cranial nerve) and spinal cord (spinal nerve). The are 12 pairs of cranial nerve and 31 pairs of spinal nerve. Unconscious nerve system control organs that work automatically. These organs do not work under central nerve instruction. Unconscious nervous system consists of motor nerve that controls the work of internal organs automatically. Unconscious nerve consists of sympathetic and parasympathetic nerves. Sympathetic nerve is a set of nerves that elongate from spinal cord to form ganglion then go to parts of body that are coordinated. Ganglion consists of nerve cell body. The examples of sympathetic nerve functions are inhibits intestine peristaltic movement, accelerates heartbeat and dilates pupils. Parasympathetic nerve is a set of nerve that starts from brain and down spinal cord (sacral), elongate to form ganglion then go to parts of body that are coordinated. The examples of parasympathetic nerve functions are pupil construction, harder digestion activation, and induce slower heartbeat inducement.